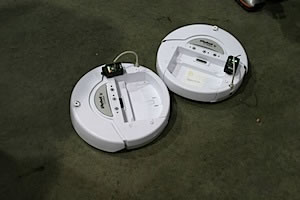 Above, Sun SPOT devices attached to iRobot Creates control them with Java software. This is the platform that we emulate in Robot View, below. This tutorial takes you step by step through the process of downloading, installing, and running the Sun SPOT robot emulation environment. It ends with writing your own Java robot program. We assume you have some basic knowledge of Java. The tutorial has four steps. We'll start by downloading the software. The absolute minimum prerequisite software before you can get started is the Sun Java Runtime Environment. Chances are good you already have this installed. Click here to test your system for a functioning JRE. If you see a dancing Duke logo, a JRE is already installed. If not, you will have to go to http://java.sun.com/javase/downloads to download and install the Sun JRE. Next, the Sun SPOT Manager Tool, a Java WebStart Application, should be able to install and configure the basic Sun SPOT SDK and everything else you need to develop programs for Sun SPOT platforms. To proceed, select your computer system from the list below and follow the instructions, returning here when done. When the installation is complete, keep the Sun SPOT Manager Tool open. In order to get the robot emulator you'll need to update to the latest Developer's Preview release. Latest SDK Release with the Robot Emulator: Now you'll need to update to the latest Developer's Preview release, as it contains the robot emulator. In the Sun SPOT Manager tool, select the Preferences tab, and then select Update Center "Dev Preview." Next, select the SDKs tab, and choose the "latest update" SDK from the Available SDKs list. Select the "latest update" SDK in the Available SDKs list. Click the "Install" button, and if installation goes smoothly, you're ready to go. If you have any problems, check the forums at sunspotworld.com. You can search existing postings or just ask. Note there is a special forum category for "FIRST Robotics." When you have updated to the emulator version, keep the Sun SPOT Manager Tool open. We’ll use it in the next step.